Crowning the top of a limestone outcropping near Portlaoise in Co. Laois, the Rock of Dunamase is a ruined castle perched above the Irish countryside. Its strategic location offered views of the surrounding landscape, making it easy to spot would-be invaders. This ideal setting became the seat of power for kings, the legendary Strongbow and later lords of Laois. Yet, the castle was soon abandoned and later destroyed. The ruins of the castle can still be seen sitting dramatically about the farms which now surround it. Want to appreciate it for yourself? Here is how to visit the Rock of Dunamase. The earliest record of the Rock of Dunamase dates back to the 2nd century AD when the site was included on a map by Ptolemy. However, there is no archaeological evidence that any buildings existed on the spot at that time. The first dun, or fortress, was built in the 9th century and soon attacked and pillaged by the Vikings in 845. The next evidence of settlers on the same site does not come until over 300 years later when a castle was built on the rocky outcropping in the 1100s and used by the Normans. It became one of the most important forts in Laois and was so strategic and desirable that Diarmuid Mac Murrough, King of Leinster, included it in his daughter Aiofe’s dowry when she was given in marriage to Strongbow. Strongbow later passed the castle at the Rock of Dunamase to his own son-in-law William Marshal, Earl of Pembroke. Marshal added fortifications and lived at the Rock of Dunamase from 1208 to 1213. The castle stayed in the Marshal family for several generations before falling into the hands of the O’Moores and eventually being abandoned in the 1300s. Already in disrepair, local legend says that the castle was destroyed by Cromwell’s forces during their conquest in 1651 in order to prevent it from being used as a stronghold. Sir John Parnell, an Anglo-Irish member of parliament, briefly attempted to restore the castle in the late 1700s, but it was ultimately left in its current crumbling state. While there are no historical records, it is commonly believed that the Rock of Dunamase was blown up by Cromwell’s forces in the 1600s. What is left of the castle are fragments of gray stone walls scattered atop a hill. Most of the castle walls date back to the 12th and 13th centuries, though there are signs of an earlier ring fort as well. The Great Hall was located at the peak of the rocky outcropping, protected on three sides by cliffs. The ruins of the thickest fortified walls are at the lowest point – protecting what would have been the only entrance to Dunamase Castle. While none of the walls are fully intact, some of the holes in the crumbling walls were intentional. The heavily defended castle was designed with “murder holes” through which archers could fire at any approaching enemy forces. The design would have been state of the art in the 13th century. When Sir John Parnell attempted to restore the castle in 1795, he incorporated medieval architectural elements that were taken from other Irish castles. These can still be found mixed in with the original ruins. The Rock of Dunamase is a castle left in ruins, but the former Irish fortress is well worth a visit when stopping in Co. Laois. There is no visitors center or entrance fee, and the hilltop position offers beautiful views of the countryside. It is free to wander around the site without a guide, and an audio guide of the Rock of Dunamase is available from the Laois City Council website. Part of the appeal of the Rock of Dunmase is its location in the countryside. However, this also means that there are not many things to do immediately next to the old castle. You can explore the Heywood Gardens, which are about a 10-mile drive from the Rock of Dunamase, past Ballinakill on the Abbeyleix road. The 50-acres of gardens, forested land, and lakes have trails for easy walks and there is a terrace overlooking the Laois countryside. Emo Court, an 18th century country house built for the Earls of Portarlington, also has formal gardens and woods which can be explored nearby. A bit further away is the Donaghmore Famine Museum, a 30-minute drive away. The museum is set inside the Donaghmore Workhouse, which was established during the Great Famine (1845–1849) in order to provide shelter and meals to poor families. The workhouse became home to about 10% of the local population, and the self-guided museum aims to tell the stories of the families who lived here during that time. The closest town to the Rock of Dunamase is Portlaoise, the county town of Laoise, which has traditional pubs, restaurants, and shops. 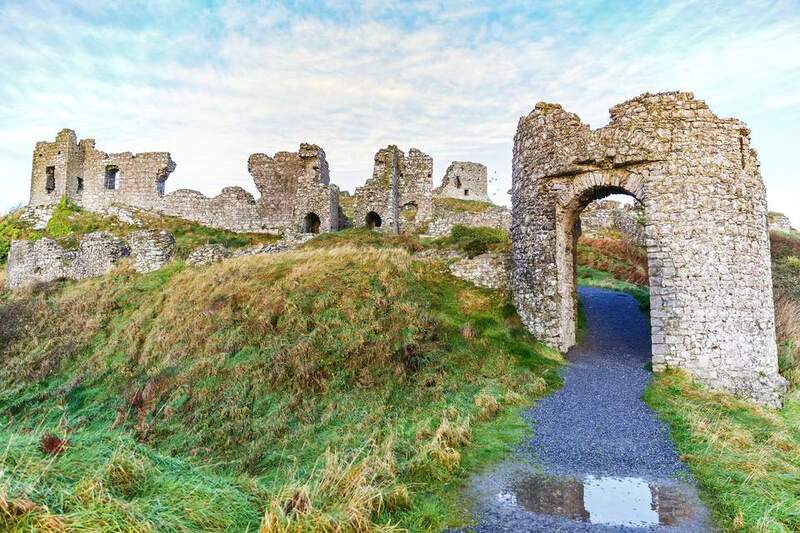 Or hit the road again to discover some more of the best castles in Ireland.